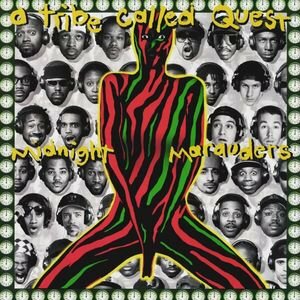 “Midnight Marauders is the third studio album by American hip hop group A Tribe Called Quest, released on November 9, 1993, by Jive Records. Recording sessions for the album occurred at Battery Studios, Platinum Island Studios and Scorcerer Sound in New York City. Its production was mainly handled by Q-Tip, with contributions from Skeff Anselm, Large Professor and the group’s DJ, Ali Shaheed Muhammad. A culmination of the group’s two previous albums, it features an eclectic, gritty sound based on jazz, funk, soul and R&B samples, in addition to socially conscious, positive-minded and humorous lyrics. Midnight Marauders debuted at number eight on the Billboard 200 and number one on the Top R&B/Hip-Hop Albums chart. The first two singles, “Award Tour” and “Electric Relaxation”, charted on the Billboard Hot 100, before the release of the final single, “Oh My God”. On January 14, 1994, the album was certified gold by the Recording Industry Association of America (RIAA), with shipments of 500,000 copies in the United States. It was certified platinum by the RIAA nearly a full year later, on January 11, 1995, with shipments of one million copies. - Listen to Chris Read’s 20th Anniversary Mixtape. - The album comes in at #2 on Ego Trip’s Top 25 Rap Albums of 1993. - The singles ‘Award Tour’ and ‘Electric Relaxation’ come in at #7 and #13 respectively on Ego Trip’s Top 40 Rap Singles of 1993. - The track ‘Award Tour’ appears on the Classic Material 1993 Mixtape. - The tracks ‘Electric Relaxation’, ‘Award Tour’ and ‘The Chase Part II’ appear on our 1993 Rap Megamix.